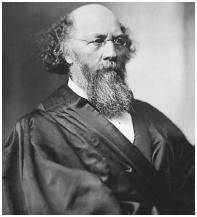 Stephen Johnson Field served as associate justice of the U.S. Supreme Court from 1863 to 1897, making him the second longest serving justice in the history of the Court. Field was a conservative who consistently upheld the interests of business. He became the prime advocate of the theory of "substantive due process," which favored private property rights over attempts by state and federal government to regulate the economy. Conservatives on the Court used Substantive Due Process to strike down regulatory legislation until the 1930s. Field was born in Haddam, Connecticut, on November 4, 1816. His family moved to Stockbridge, Massachusetts, when he was a young child. At thirteen he was sent to Turkey to live with his sister and her missionary husband. They later moved to Athens, Greece, where Field remained until entering Williams College in 1833. After graduating in 1837 he read the law with his older brother, David Dudley Field, who had emerged as a prominent New York City attorney and legal reformer. In 1849 Field left New York City for the Gold Rush in northern California. He speculated in land, developed a thriving legal practice involving property and mineral rights, and organized the town of Marysville. He became Marysville's mayor and judge. In 1850 he was elected to the state legislature. He was instrumental in organizing standards of procedure for civil and Criminal Law and he also drafted mining laws. He ran for the state senate in 1851 but was defeated. "The present assault upon capital is but the beginning. It will be but the stepping-stone to others, larger and more sweeping, 'til our political contests will become a war of the poor against the rich; awar constantly growing in intensity and bitterness." Field was elected to the California Supreme Court in 1857. He became chief justice in 1859 and served until 1863. He concentrated his efforts on cases dealing with titles to land and mineral rights. In 1863 President Abraham Lincoln, a Republican, appointed Field to the U.S. Supreme Court. Though Field was a Democrat, he was a loyal Unionist during the Civil War and a well-respected state judge. Field established his opposition to government interference with business in the slaughter-house cases, 83 U.S. (16 Wall) 36, 21 L. Ed. 394 (1873). The case involved a Louisiana state law that allowed one meat company the exclusive right to slaughter livestock in New Orleans. Other packing companies were required to pay a fee for using the slaughterhouses. These companies filed suit, claiming that the law violated the privileges and immunities clause of the Fourteenth Amendment. The Court upheld the Louisiana Monopoly law, ruling that the Privileges and Immunities Clause had limited effect as it only reached privileges and immunities guaranteed by U.S. citizenship, not state citizenship. Field wrote a dissent, maintaining that "the privileges and immunities designated are those which of right belong to the citizens of all free governments." He saw the clause as a powerful tool to keep state government out of the affairs of business and the economy. Field saw an opportunity to use the Fourteenth Amendment's due process clause to curtail government interference with business. He first articulated the idea of substantive due process in his dissent in munn v. illinois, 94U.S. 113, 24 L. Ed. 77 (1876). The majority upheld the Illinois legislature's right to fix maximum storage rates charged by grain elevators and public warehouses and to require licenses to operate these facilities. Field contended that the regulations violated due process and that under the U.S. system of government the legislature lacked the power "to fix the price which anyone shall receive for his property of any kind." By 1890 he had convinced the majority of the Court that his view of the Due Process Clause was correct and had extended its reach to the Fifth Amendment's Due Process Clause, using it to invalidate federal legislation that regulated business. Until the 1930s the Court overturned a succession of state and federal laws that attempted to regulate business and labor. Field voted to strike down a federal Income Tax in pollock v. farmers' loan and trust co., 157 U.S. 429, 15 S. Ct. 673, 39 L. Ed. 759(1895), seeing the tax as a plot against capitalism. In his concurring opinion, Field warned, "The persistent assault upon capital is but the beginning. It will be a stepping stone to others larger and more sweeping till our political contests will become a war of the poor against the rich, a war constantly growing in intensity and bitterness." Field entertained political ambitions while on the Court. In 1880 he sought the Democratic Party presidential nomination but did poorly at the nominating convention. He became increasingly infirm during the 1890s and did little work. He was determined, however, to break John Marshall's record of thirty-three years on the Court. He achieved that record in 1896 (later to be surpassed by williamo. douglas) and retired in 1897. He died in Washington, D.C., on April 9, 1899. Kens, Paul. 1997. Justice Stephen Field: Shaping Liberty from the Gold Rush to the Gilded Age. Lawrence: Univ. Press of Kansas. Pomeroy, John Norton. 2003. Some Account of the Work of Stephen J. Field as a Legislator, State Judge, and Judge of the Supreme Court of the United States Clark, N.J.: Lawbook Exchange.